Lavender blooms and lush velvet greenery evoke a celebration of a life well lived. This standing spray is a elegant and comforting way to honor your loved one's memory. 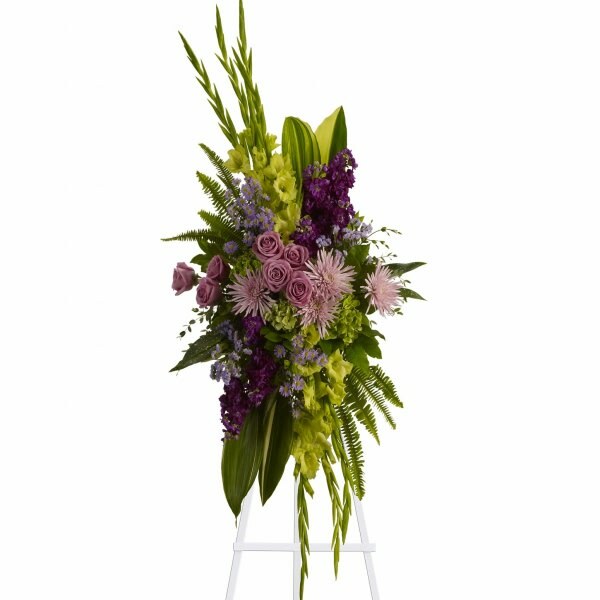 • A lovely mix of flowers such as lavender roses, chrysanthemums, statice and asters are beautifully complemented by glossy green aspidistra leaves, fern and fragrant eucalyptus. 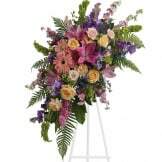 • This arrangement measures approximately 25" W X 54" H.
Flowers will be received by a Morrison Funeral Homes' staff. All of our flowers are designed and delivered by hand from a local florist in in Tuscumbia.